49ers Were Bold While the Redskins Were Old (School)! Jimmy Garoppolo has a long-term contract in place with the San Francisco 49ers just months after they traded a second-round pick for him. 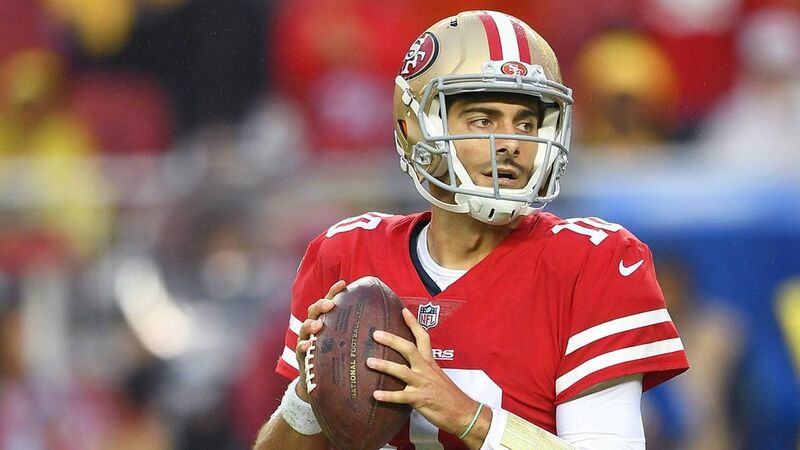 The new five-year deal, first reported by Mike Garafolo of NFL Network, is scheduled to pay Garoppolo $137.5 million if he fulfills the deal and an average of $27.5 million per year. Adam Schefter reported that Garoppolo is due to make almost $90 million in the first three years. Pretty crazy for a guy with just seven NFL starts, huh? Seven starts and seven wins, which is worth either everything or nothing, depending on your view. Clearly for the San Francisco 49ers and Kyle Shanahan, they saw enough to make Garoppolo the highest paid quarterback (for now) in NFL history. “Jimmy G” threw 178 passes for the former Redskins offensive coordinator and the Niners rolled to five straight wins to end the year. Garoppolo completed 67.4% of those attempts with seven touchdowns and five interceptions. How could San Francisco pay that much for somewhat average statistics and such a small sample size? They must be nuts, right? Well no! They’re smart and they understand the market and cold, harsh realities of the free agent to be quarterback market. It’s a position and a time that you absolutely cannot exercise extreme caution. You must move fast and quick. You identify the talent you have, on and off the field and move on it. Ahh, you knew that was coming, right? This deal might come back to haunt the 49ers if Garoppolo gets severely injured and cannot play or if he gets exposed with a full 16 game schedule. There’s risk and obviously, nothing is guaranteed. But what is? Nothing in the NFL is. You have to be aggressive and bold. That’s why you hire scouts and smart coaches, like Shanahan. Shanahan brought Garoppolo to San Francisco and slowly ramped him up before turning him loose. Shanahan, his staff and John Lynch observed, watched and clearly made a decisive choice. They did all of this over five games and roughly eight weeks of practices. They did this with countless meetings and film sessions. They did this with the knowledge that Jimmy G was tutored by the best ever, by a creative offensive coordinator and the best head coach of this era, by far. It’s preposterous to think that the 49ers made this decision based on only five games. That’s never how it works, yet so many uninformed blowhards will pound that message. Only time will tell if they made the right decision, but it says here that they already made the right call. An aggressive one, which is half the battle. If you are smart (they are) and identify what you want, at the ultimate position, you go out and get it and you pony up before that player hits the market and becomes available or before you have to pay the franchise tag rate for not only one year but the life of the contract. Once again, something the Redskins did not believe was true. Something that many Redskins fans did not understand. I preached over and over again in this space that the Redskins putting the franchise tag on Cousins would be the end of any reasonable chance of a long-term agreement. I was, of course, correct. The sides never came close. And now, Garoppolo beat Cousins to San Francisco and Shanahan’s heart BUT Cousins still benefits. Eventually, Cousins will be an unrestricted free agent and he will get paid more than Garoppolo. He’ll probably get paid a good amount more than Garoppolo and HE SHOULD. The Redskins failed to realize how proper market value works and how correct negotiations work, especially at the quarterback position, in a league starved for competency and good, way more than great. The 49ers realized what good and competent looks like right away in weeks!!! The Redskins had three years of practices and a few games, here and there to evaluate Cousins BEFORE 2015. Then they had the entire ’15 season as the number one quarterback to figure out what they had. They never did. They thought they were being cute by low-balling Cousins because they thought (wrongly) he would be desperate to get ANY KIND of long-term commitment. They didn’t know their quarterback. They didn’t know their employee. So then when they realized they were wrong, they thought “Oh – we’ll put the $20 million tag on Cousins” because it’s just a figurative number. It doesn’t do anything to the overall salary structure of the quarterback position. Many fans and pundits agreed. They were warned in this space of how wrong they were. The first franchise tag was the killer blow and it completely ruined any legitimate chance of a long-term marriage. Cousins “market value” on a five-year contract BEFORE Brock Osweiler’s deal in Houston and BEFORE the franchise tag was placed was about $35 million in fully guaranteed cash, an average of $18-19 million per year and a total face value of $90-100 million. That’s obviously nothing to sneeze at and certainly a risky commitment but everything in life and in the NFL is a risk. Players you bring in via free agency and the draft are all a risk. Obviously, there are different levels to risk and the Redskins weren’t willing to take that chance. The problem? They thought they were cute. And right. And smart. They not only were not willing to take the risk, but they were willing to double down on that by offering Cousins an embarrassingly low multi-year offer around the same time. They thought that the tag would scare Cousins and his agent, Mike McCartney into panic. They were laughably wrong. McCartney smelled a rat from the start and knew patience for his client (while a small risk) was the best course of action. So they waited and didn’t blink. They went to the window and cashed $44 million guaranteed for TWO years of service and commitment. Now, they’re poised to hit a grand slam and possibly sign a five-year, $150 million-dollar contract with around $100 million or so guaranteed and over $65 million in fully guaranteed funds at signing. Their risk paid off. It was a calculated gamble on Cousins and McCartney’s part that Cousins would stay healthy (he did) and that he would deliver (he did). How well he delivered depends on your perspective and that is a different argument. Many have said he didn’t, because the Redskins didn’t win enough games. That part is true. However, only a fool (and there are many) solely judges a quarterback strictly on wins and losses. That’s not how it works. Winning is very important. Playing well in big games and big spots is very important too. Certainly, Cousins track-record in this area is very much up for debate but his statistical production, durability and competency is WORTH A FORTUNE. That’s something many fans and members of the media do not understand. That’s something that the Redskins NEVER were able to comprehend, despite how “smart” Bruce Allen is. That’s something that the San Francisco 49ers knew they could not wait to truly find out about Jimmy Garoppolo. So they used the data that they cultivated in a short time-span and made a bold, aggressive decision. It might come back to haunt them but it says here – even if Garoppolo is nowhere near as good as Kyle Shanahan thinks he is – the 49ers made not only a smart move, but they learned a huge lesson from the Redskins arrogance and incredibly naïve thought process. Once again, Kyle Shanahan proved that he is highly intelligent and knows what you MUST have to win in the NFL. Something the Redskins haven’t figured out for eight years under Bruce Allen and the last quarter century.